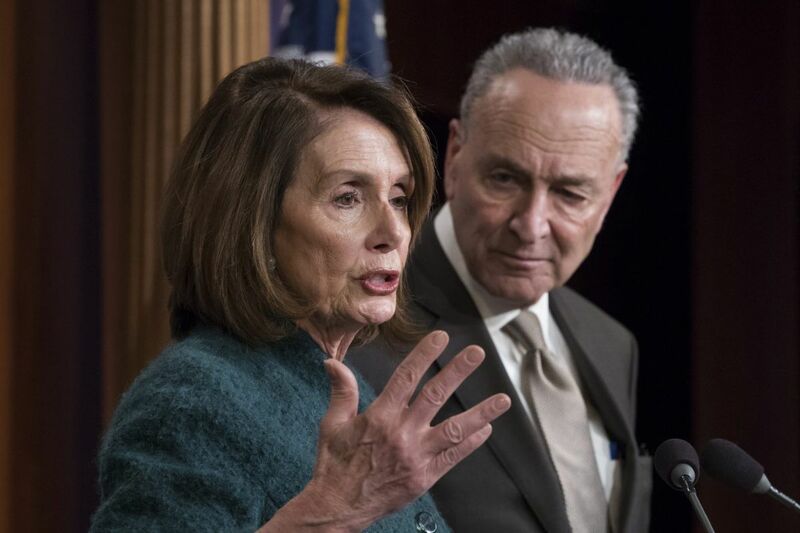 House Minority Leader Nancy Pelosi, D-Calif., and Senate Minority Leader Chuck Schumer, D-N.Y., speak to reporters about the massive government spending bill moving through Congress, on Capitol Hill in Washington, Thursday, March 22, 2018. WASHINGTON – Congress cleared a sweeping $1.3 trillion spending bill early Friday that doles out enormous increases to military and domestic programs alike, as Republicans and Democrats joined to block most of President Donald Trump's proposed budget cuts and place obstacles in the way of his immigration agenda. The House passed the 2,232-page bill Thursday on a wide bipartisan vote. And after a day of maneuvering – including a bizarre dispute involving a senator upset about the renaming of a wilderness area after a deceased political rival – the Senate followed suit early Friday morning, passing the legislation 65 to 32. "Is it perfect? No. Is it exactly what we asked for in the budget? No. Were we ever going to get that? No. That's not how the process works," Mulvaney said. "This is what a bill looks like when you have 60 votes in the Senate and the Democrats get a chance to take their pound of flesh." For hours after House passage, the legislation stalled in the Senate, where the chamber's rules grant a single senator significant latitude to hold up a vote. Attention was initially focused on Sen. Rand Paul, R-Ky., who forced the government into a brief shutdown last month when he objected to abudget bill that set the parameters for the legislation that is now pending. Paul's tweetstorm highlighted what he views as wasteful spending in the bill, and he posted a picture of himself holding the hefty bill, while glaring balefully at the camera. "Shame, shame. A pox on both Houses – and parties. Here's the 2,232 page, $1.3 trillion, budget-busting Omnibus spending bill," the caption read. Finally, late Thursday night, Paul spoke on the phone with Majority Leader Mitch McConnell, R-Ky., and subsequently relented, telling The Washington Post that he'd been successful in drawing attention to problems with the bill, and was prepared to allow votes to go forward. "No. What part of 'no' don't you understand? . . . Do I have a problem with my English? I don't have any comment," he told reporters outside the Senate floor. "Sometimes you save the president from himself," said Rep. Tom Cole, R-Okla., arguing the administration would not want to be in the position of cutting the NIH budget if a new pandemic comes along. "Look, a new administration always runs on things, and may or may not know government intimately." Conservatives fumed at the generous increases for many agencies, with some arguing it undercut their party's claims to fiscal restraint. "I don't understand why when President Obama does what we're about to do, it's bad for the country, but when we do it, it's good for the country," said Sen. John Neely Kennedy, R-La. "This bill is going to need a lot of Democratic support, and I suspect it'll get it. They're just as happy as kids at Christmas." Other Republicans, including House Speaker Paul Ryan, R-Wis., argued the legislation fulfilled Trump's governing agenda, including increasing military spending and funding a wall along the U.S.-Mexico border. "This bill starts construction on the wall," he told reporters. "It funds our war on opioids. It invests in infrastructure. It funds school safety and mental health. But what this bill is ultimately about, what we've fought for so long, is finally giving our military the tools and the resources it needs to do the job." House Minority Leader Nancy Pelosi, D-Calif., called the bill "a tremendous victory for the American people," one that keeps domestic agencies robustly funded while turning away Trump's push for even more money for the border wall and immigration enforcement. "If you want to think you're getting a wall, just think it, and sign the bill," she said. "There's no way humanly possible to read 2,232 pages," said Rep. Thomas Massie, R-Ky., who opposed to the bill. "Sometimes they jam you, but they pretend to give you three days to read it. All the veneer is off now." The Washington Post's Karoun Demirjian and John Wagner contributed to this report.